After the death of their beloved father, two teens go to their grandmother's house in Florida and begin to suspect their grandparents of murder. 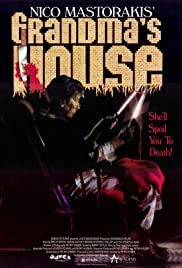 Looking for revenge for past incenstous experiences, a slasher invades a lonely farmhouse. Two policemen are brought back to life to chase down supernatural criminals. She'll Spoil You To Death! Boy at Pool: If I had a sister like that, I'd boff her! Music Published by Omega Music, Ltd.
Two teens go to live with their grandparents after both their mom and dad die, but grandma and grandpa have a few skeletons in their closet that are about to explode. Film is tightly paced and well edited. It also has many shocking and most important believable twist and turns and once you think you have it figured out, it throws another surprise at you. Very unpredictable. Film also has Brinke Stevens only good performance, though the rest of the cast is so-so. A very little seen gem of a film. Not a horror film like many believe it to be, but more of a suspense film. My Rating: 8 out of 10. I still can't believe this film got so many negative reviews.